Leadership is about vision and responsibility. The Investiture Ceremony of St. Anthony’s High School for the academic session 2019-2020 was held with great spectacle and dignity in a special ceremony on 6th February 2019 on the school quadrangle. The event was presided over by the Manager and the school Principal. It was conducted with the high degree of earnestness and passion. The Investiture ceremony signifies the reliance and confidence that the school consigns in the newly elected office bearers. Donning the mantle of accountability, they also pledge to bestow their duties to the best of their abilities. We believe that the child-centric approach will frame a responsible citizen. The ceremony was held with lots of zeal and zest. 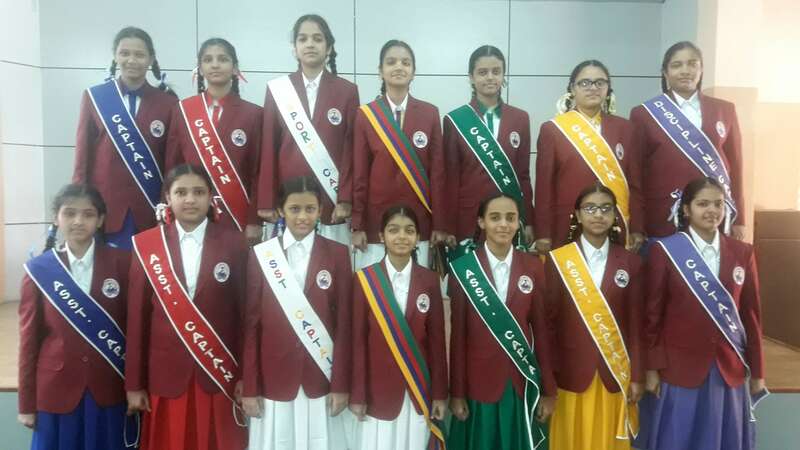 The elected Leaders were conferred with sashes, badges and blazers embroidered with the school logo by the Manager, House Mistresses and the Principal. The students’ council took the pledge to hold the school motto of “To Truth Through Love” in high esteem. Sr. Principal congratulated them and admonished them to be impartial and honest in discharging their duties. Sr. also urged them to uphold the values. Sr. reminded them that with position comes responsibility towards themselves, their school and peers and struggles that will help one to achieve heights. The Principal Sr. Maria Selvam also appreciated and congratulated them. Sr. advised them to be role models and extended a supporting hand to the students’ council for the smooth running of the school. The function concluded with the School Anthem.